A walk-off home run is a thrill under any circumstances. That the hitter was Chris Gimenez makes it an even bigger thrill. The setup could not have been better. The Bulls went into the 9th inning trailing 2-1. Leslie Anderson singled. Shelley Duncan doubled. Mike Fontenot was hit by a pitch to load the bases. A sac fly by Kevin Kiermaier brought Anderson home. Then Gimenez put a 1-1 pitch over the Blue Monster. From the stands this has seemed like a very tough year for Mr. Gimenez. He was the last man standing out of spring training for the Rays’ third catcher job when his main competitors, Stephen Vogt and Robinson Chirinos, both left the Rays system. So it seemed like he had a shot for an early call up. But his hitting has not gotten on track this season, apparently due to an odd injury to his hand. Plus, the failure of the Rays to keep the Bulls outfield populated has meant he has had to spend a lot of time in the outfield. The result is that this has been his worst season at bat in his career. Nevertheless, as he showed last night, he can do it, and do it with some style. He’s probably a lock for a September call up, which is too bad for the Bulls since they could use him for the playoffs. Before that moment, it was something of a slip-sliding evening as the Bulls played through the rain. (Note: this is the wettest summer in recent North Carolina history. A tribute to the Bulls groundskeepers to keep the field playable). Trivia question: What agricultural product is the source of Diamond Dry, which we saw used in copious amounts last night? (answer in the comments). J.D. Martin pitched just fine and if the game had been called at the 5-inning mark he would have picked up his 15th win and a Bulls record. But his own error in the 6th let a man on base who eventually scored, so Martin left with the game tied. So, let’s just savor the thrill of a walk off. And let the Bulls enjoy their well-deserved day off. It’s been 24 days since the last one. 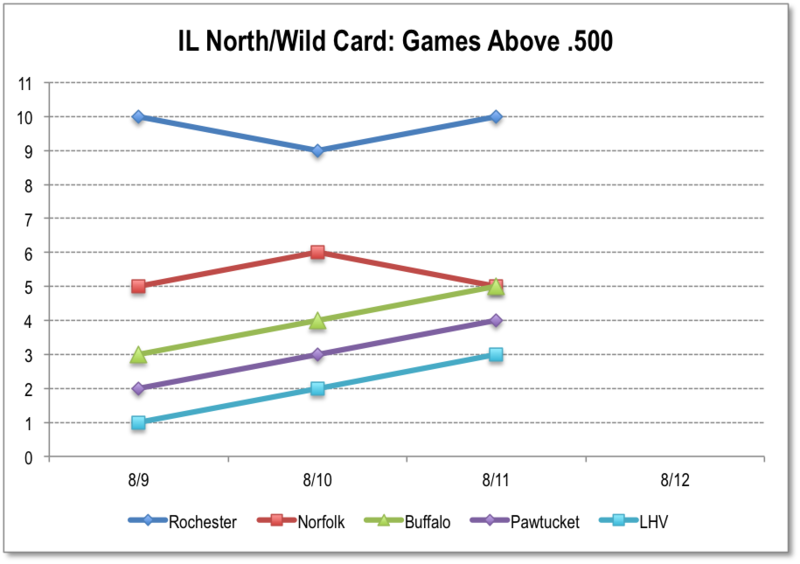 Unless something really weird happens, the top two teams on this chart are going to be playing in the first round of the Governors' Cup this year. One of the them will win the North Division and the other will win the wild card. So we’re going to start tracking it just for fun. 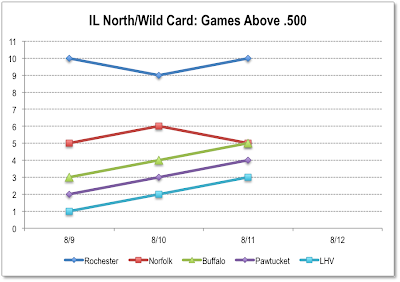 Of course, if the season ended today, we’d have a tie for the wild card spot between Norfolk and Buffalo! Answer to trivia question: Diamond Dry is made from corn cobs.